The article was published on 16 May but as you can imagine, there was no mention of the Gaza border massacre that took place two days earlier. Not a word. I guess that Shor knows little about British history and Churchill in particular. Churchill, was a man with many blunders attached to his name. You may not like what Shor is saying, but this is how many Israelis and Jews interpret Netanyahu’s policies. 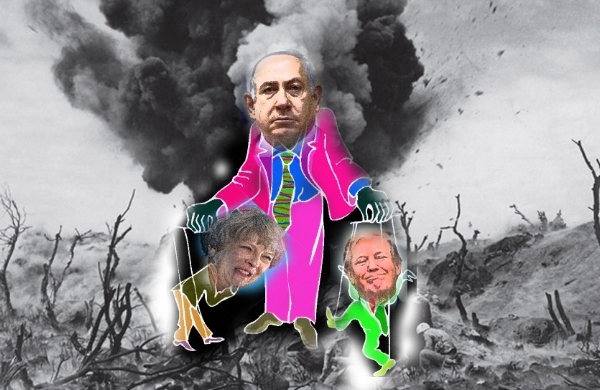 In the eyes of many Israel-supporting Jews, Bibi is the puppet master. President Trump, the Congress, Theresa May and Macron follow the path cleverly laid for them by the Israeli PM. I guess that self love is a serious form of blindness and it is that blindness that has made Jewish history look like an on going disaster.